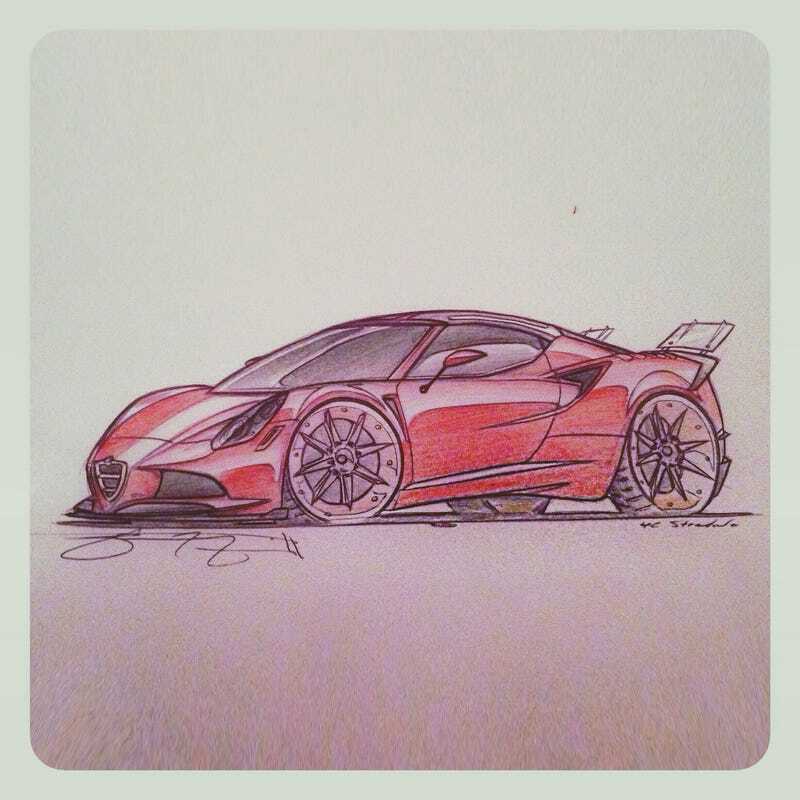 Besides the fact that I absolutely butchered the proportion (wheelbase too short and the rear wheel has way too much camber) I think this turned out good enough to post, especially since it was done entirely by hand on a standard 8.5/11 inch paper (I usually use drawing board for my more serious works). I wanted to have some hints of the original 33 Stradale, so you'll see a T-Top roof (which would actually be two carbon panels that could be removed with a structural "T" in the middle for increased rigidity) as well as an 8C Competizioné like front end, with adjustable cable operated cooling flaps for the brakes just above the front splitter. From the side, there are lowered and thicker side skirts to resemble the Alfa Diva concept of 2006, a front fender vent aft of the front wheels, and some forged brushed bronze wheels with Center caps. Out back, it's finished off with some brake heat escape vents atop of the rear fenders, a carbon diffuser, and the piece dé resistance: A clear plexiglass double airbrake/spoiler that is cable actuated and makes a little "shzwooh shzwooh" sound when it moves. I guess the car would be a bit lighter, and the power would be upped to around 350HP - more than enough power to propel this little sports car along.